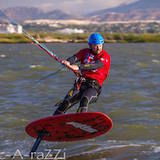 Bay Area Kiteboarding • View topic - Good race board for getting started? Good race board for getting started? After 5 years of kiting, I am looking to get into racing this year at the St Francis. Trying to find a board that will be good for me to practice and race on, without getting too crazy on price, etc. I am seeing a fair number of deals online for the 2011 Cabrinha Race 178. What do you guys think about this as a starter board for racing? Should I pull the trigger or see if I can find a used one locally once the season gets going? Thanks for the advice! Re: Good race board for getting started? Just been through a similar process. Firstly I have no experience of riding course boards. Most people will tell you to stay away from the older "narrow" quad fin boards and go to a "box rule" style 70cm wide board. There are some around in SF at the moment. I got a used board from Cali kites in SF, they have a couple of others too. Live2Kite also has quite a few newer boards, plus some older quad fins and good prices. It seems like the older boards can't compete with the newer ones around a course, obviously have no idea what that means in real terms. Maybe you'll end up mid pack, maybe you'll be way off the back of the field, I don't have enough experience to know. They obviously work it terms of being able to sail though so your decision kind of come down to how competitive you need to be. Crazy on price seems to be hard to control wehen the word "race" gets added Even if you find a "cheap" race board you'll still need to add on fins, even foot straps start to get expensive when you need six of them. Not to mention that people seem to have 2m increments in their kite sizes! Ah racing..... I'm sure it will be fine once I get on the water. Got a proto to the latest 2013 coming from Alex Aguera. May have a couple more. Let me know if you are interested.